I have noticed a trend on Line in the last few weeks, and I feel stupid for not doing this sooner. It’s really simple: A picture says more than a thousand words. And over the past few weeks, I have seen plenty of illustrations/pictures that depict certain elements of the game, as a short guide so to speak. And if we look at gear and gems for example, I have articles on Best gear Sets, where and how to use Gems, which gear attributes go where when…and then we have Hero Skills going in the mix as well…. And although they are good reads to get familiar with he material, it’s mostly text and not suited for quick referencing. And while chatting such as in Line, it is much easier to give a picture than explaining it word by word every time. 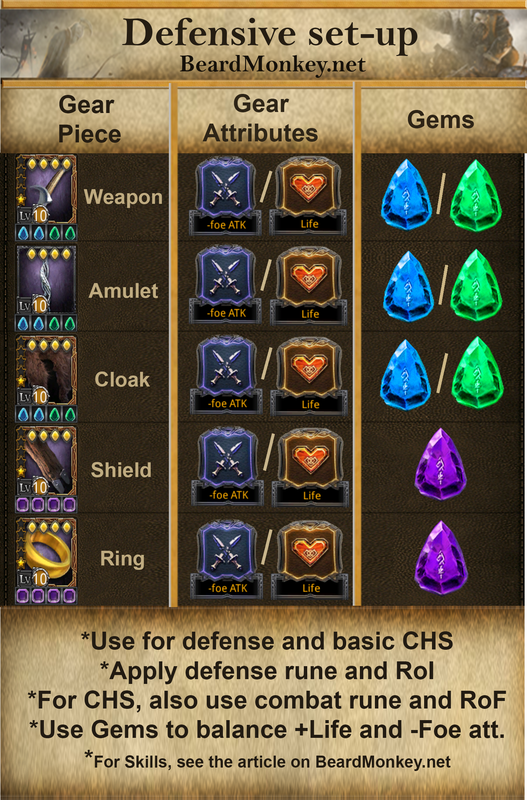 So here below the fold I have posted some illustrations for basic gear/gem set-ups. I know other versions are also around, but hey, I like some photoshopping and I like it to be available on the site. Feel free to download them and share them on for example Line, whenever a tournament starts again and people start asking the same questions. First is a defensive set-up. Focus on gear with +Life and -Foe attack attributes. 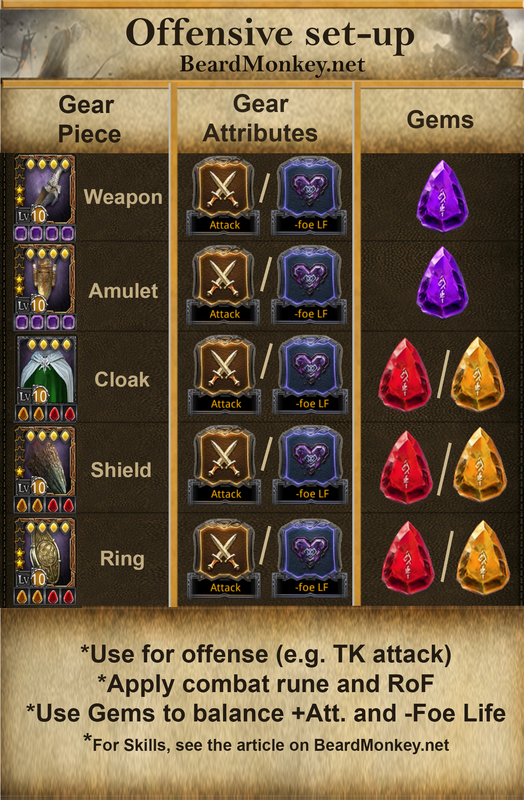 Likewise, put your highest Artamir Gems in your Shield (+Life) and Ring (-Foe attack). Use your cloak, weapon and amulet for Emerald and Sapphire Gems. Remember: use Gems to balance out your total +Life and -Foe attack buffs as even as possible. This set-up is used in defending during TK and serves as the base gear set for all CHS. Only at high levels of gear and gems do you also use mixed gear sets (3.). Contrary to the defensive set, here you focus on gear with +Attack and -Foe Life attributes. Artamir Gems go into the weapon (+Attack) and amulet (-Foe Life). Citrine and Ruby Gems fill out your cloak, shield and ring. Same as before, use your Gems to balance +Attack and -Foe Life as evenly as possible. This set-up is mostly used in TK for attacking. 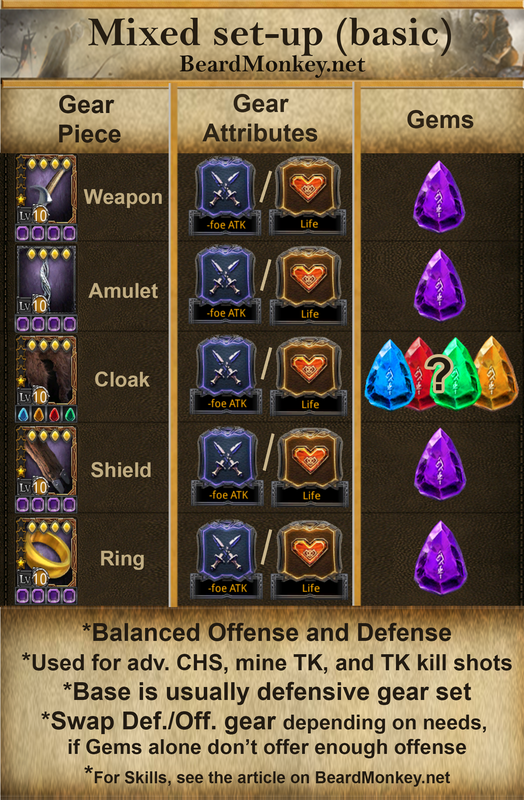 Best way to start (given you have enough demount runes) is to insert Artamir gems in weapon and amulet (point 3). This way, you will increase your total buff/debuff percentage, as Artamir Gems go higher at the moment compared to rainbow Gems. This is mostly not the case for point 1, and definitely not so for point 2. If Artamir Gems don’t offer enough offensive buff/debuff, go to either point 1 or 2 and swap around gear and rainbow gems. Here, you need to try to balance both +Attack versus -Foe Life, AND +Life and -Foe Attack. This set-up is used in advanced CHS, TK killshots (rarely though), and is popular for mining warfare. And that’s it for this very short post. Like I said, feel free to download these and share them around as a quick reference. Happy Hobbiting! This entry was posted in Articles and tagged -foe attack, -foe life, amulet, artamir, attack, battle, bonus, buff, CHS, citrine, cloak, debuff, defensive, emerald, equipment, gear, gem, hero equipment, illustrations, kabam, kingdoms of middle earth, KoM, life, offensive, rainbow, reference, ring, ruby, sapphire, shield, tk, tournament, weapon by beardmonkey. Bookmark the permalink. First – bravo and thank you, fantastic site. In your gem setup, where for example you have defense weapon blue/green, is your intention that you should place two blue and two green gems? Or that each piece should be all the same gem color but on that piece you could use either blue or green? If working for balance, it would see having two and two is the way to go, but I just want to be sure I understand your intent. I use Bilbo cloak 2 for attack with a 4* life debuff and is better than the necro one. Also, on the mixed set-up, aka mines heroes, i use smaug tooth, 1 or 2, a good 4th attribute on this one is difficult.